I love my new lunch bag and it’s really a perfect bag that goes with my lunchbox. When I went to the park last week, I got a couple of compliments when I was using the bag and the lunchbox. This wool insulated natural lunch bag with orange trim on the side is made of insulated with wool and is 100% unbleached certified organic cotton canvas. It’s really handy, soft and having this bag really keeps my food cool and fresh. What I love about this bag is that they have a couple of pockets where I can put some stuff aside from my food. This bag is perfect for my new stainless steel lunch box, it really fits perfect. 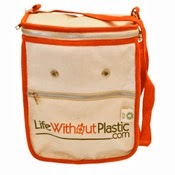 If you want to have this kind of really cool bag for any of your lunch boxes, check out this place, lifewithoutplastic.com become their Facebook and Twitter fan to get your food stay fresh and cool!